All of the North Myrtle Beach vacation rentals at Coastal Dunes are on the oceanfront so you can sit on your private balcony and relax in your living room and still see the white sandy beaches and beautiful Atlantic Ocean. Coastal Dunes is a North Myrtle Beach resort that is located in the very popular Ocean Drive section of North Myrtle Beach, South Carolina. Famous for its beach clubs with shag dancing and the constant sound of beach music wafting through the air, Ocean Drive is a real hit for those who like the charm of Main Street’s shopping and dining. Main Street is within walking distance of the Coastal Dunes resort. This North Myrtle Beach resort has a smaller number of North Myrtle Beach vacation condominiums as it is a more intimate setting. This North Myrtle Beach resort has three levels of North Myrtle Beach rentals and is built on stilts with parking on the ground level. There is a staircase at both ends of the short hallway at Coastal Dunes so getting from your car to your North Myrtle Beach condo rental is easy. Also on the ground level at this North Myrtle Beach resort is the sparkling blue swimming pool. The fenced-in pool area has chaise lounge chairs and lawn chairs so you can take it easy while the rest of your family swims in the bright blue pool. The pool deck faces South Ocean Boulevard so you can see all the hustle and bustle of the Ocean Drive section of North Myrtle Beach, South Carolina while enjoying your poolside perch. 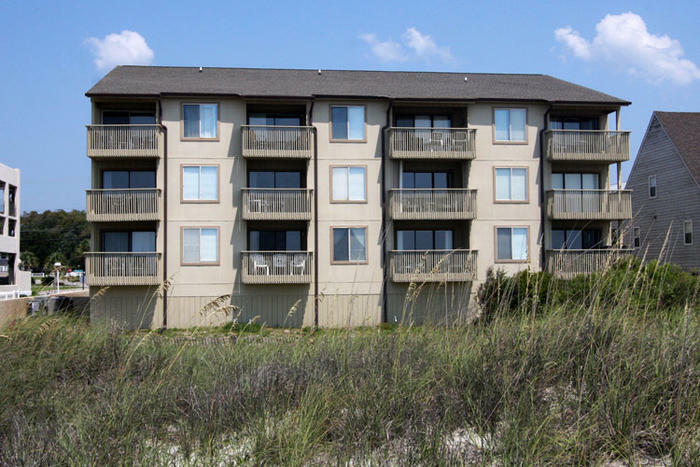 The North Myrtle Beach vacation rentals at Coastal Dunes include spacious three-bedroom North Myrtle Beach condominiums and even larger four-bedroom North Myrtle Beach rentals. Both sizes of North Myrtle Beach condominiums have two baths for your convenience. And these condos in North Myrtle Beach, South Carolina sleep either six or eight people comfortably. Featuring a well equipped kitchen in each of these North Myrtle Beach vacation rentals, Coastal Dunes is a handy place to spend your North Myrtle Beach vacation. There is a dishwasher in the kitchen, which can be so convenient, and also a microwave, in addition to the full-size refrigerator and a stove with an oven.